National Geographic Kids Myths Busted! 2: Just When You Thought You Knew What You Knew by Emily Krieger. Review: Funny facts, surprising facts, facts proven to be wrong! Learn new and surprising things at the same time. Well, Myths Busted! 2 by National Geographic: Kids is a great book to read. This book includes facts that are believed to be true. Myths Busted! 2 has many facts to present to the reader. There are many common beliefs that are inaccurate or just plain wrong. For example, is cheese a mouse's favorite meal? Are they always craving cheese? Incorrect! Mice eat what they can get their tiny paws on. If that was interesting, the book offers more! Myths busted! For centuries people have believed facts that are wrong. This book explores facts that people have believed. Moss grows only on the north side of trees? The truth is in this book. This book contains many facts about things you may believe to be scientifically proven. In addition to the silly facts, there are scientific facts, animal facts, space facts, food facts, and more. I thought this book was interesting in so many ways most of the facts surprised me. I would recommend this book to anyone who likes to learn. Everyone can grow to like this this book, and with this handy little book, you can outsmart almost anyone! Give a test to someone you know. I enjoyed this book; you will too. Test your knowledge with this book. This book is good to read in a car, vacation, or wherever you want. Share the book with a friend, a parent, or anyone you know. Review written by Kyle (6th grade student). We would like to thank National Geographic Kids for providing a copy of National Geographic Kids Myths Busted! 2: Just When You Thought You Knew What You Knew for this review. 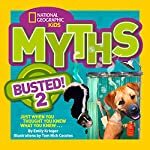 Have you read National Geographic Kids Myths Busted! 2: Just When You Thought You Knew What You Knew? How would you rate it?